We’d love your help. Let us know what’s wrong with this preview of Why the Chicken Crossed the World by Funky Chicken. A brilliant collection of hilariously poignant true stories illustrate what China teaches us about happiness, wealth, love, power, and getting what you want. Based on a successful, witty blog by a Chinese-American expatriate in Shanghai, these impactful insights loved by worldwide readers illuminate how China changes your world at home. Experience this amusingly honest res A brilliant collection of hilariously poignant true stories illustrate what China teaches us about happiness, wealth, love, power, and getting what you want. Based on a successful, witty blog by a Chinese-American expatriate in Shanghai, these impactful insights loved by worldwide readers illuminate how China changes your world at home. Experience this amusingly honest resident’s view of the most influential country in our lifetime. Peek into an entertaining and thought-provoking world that you won’t find described in newspapers or textbooks. China: where is all that money coming from, and will it really rule the world? Only in China could you fall into the glamorous expat life of having a personal driver, maid, and private Mandarin tutor—only to quickly learn that your “help” are all richer and more financially savvy than you. Enter a realm of wild possibilities, and the twisted ironies of the world’s fastest-growing emerging market. A 50-year-old maid’s family was so poor during the communist Mao era, they bought their son a wife in exchange for a watch. Decades later, that same maid bought her daughter a nose job, and accidentally turned her into a model. In China today, a new luxury mall magically appears the week you go on vacation. Weekends are spent at fabulous pool parties. Yet this authoritarian state is still far from democratic—just ask Chinese mothers who create “dating resumes” to pimp their children out at marriage fairs. Learn the tricks of life success, seen through the twinkling eyes of a mischievous humorist. 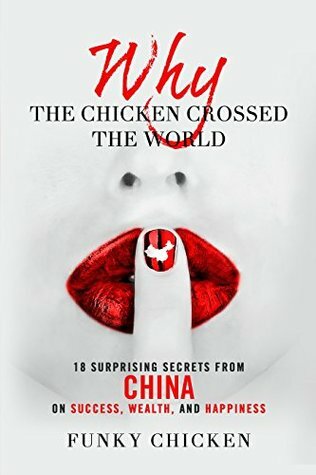 Follow the sassy and smart Funky Chicken—shameless enough to nearly do a TED talk in a chicken suit, but wise enough to create a pen name in authoring this tell-all tale about the world’s most powerful communist country. Flirting with China is fun; getting arrested is not. What can you learn from China, and how will it change your life? See for yourself. To ask other readers questions about Why the Chicken Crossed the World, please sign up. An expat insider's view to living and working in modern China. With photos! I enjoyed reading this and learned a lot about the local's way of thinking. Interesting facts and viewpoints. Easy, enjoyable read about the author's experience as an American-born Chinese person living in China as an expat. Full of funny anecdotes. Interesting anecdotes of life and business in China. If you need a pick-me-up, this is THE BIBLE. I cannot re-emphasize it. Sure, there's Bill Bryson and his tales, but if you want a short-story speed-book format of something similar for life in China, these 18 baffling secrets will have you wanting and acheing for more! The Funky Chicken's book is an extremely candid, laugh-out-loud take on what it means to be an expat and live in China, amidst its many perplexingly interesting and funny customs, history and everyday life. The Funky Chicken bring If you need a pick-me-up, this is THE BIBLE. I cannot re-emphasize it. Sure, there's Bill Bryson and his tales, but if you want a short-story speed-book format of something similar for life in China, these 18 baffling secrets will have you wanting and acheing for more! The Funky Chicken brings to this book her quintessential spirit and amazing sense of humor, her keen eye of observing details about life around, even when she is fully immersed in it and the way she has brought it all to life for us! Having lived in China myself for 4 years, I am completely a fan of this book and find myself picking it up and re-reading chapters from time to time, every time I need a big laugh. Take a bow, Funky Chicken - and thanks for making my day over and over again, every time I read your book!! A book that makes you laugh is always a book you can't put down. Loved laughing at the author, and then with. The chicken's take-aways are not necessarily life-changing, or even eye-opening, but they serve as pretty good reminders to try & always make the best of what we have. To be honest, I'd not heard of any Funky Chicken before this book. To be fair, I'll never be able to forget the Funky Chicken since completing this book. A casual yet amusing read about life as an expat in Shanghai. Experiences in China varies from person to person, place to place... But the accounts here certainly sound right to me and in line with my experiences of the country and its people. Humorously written 18 short stories. Definitely worth a read, I finished it while eating lunch and would definitely be looking out for more funky books from a Funky ABC (American-born Chinese) Chicken.